Accommodation is in beautifully appointed Indo-african en-suite bedrooms that are vibrantly ethnic. Rooms are directly adjacent to the elephant stables. Join us for an intimate overnight stay in our ten-bedded Indo-African guest lodge. Your room shares a common wall with one of our elephant's stables - you will be amazed how quiet they actually are! Check in and chill out observing the elephants from the main deck or have a swim in the lodge pool. 17h00 See the elephants stabled for the night followed by a walk to the mountain deck for sundowners. Return to the lodge for a four course dinner in the boma where you can relax around a log fire. 07h00 - next morning - Be ready on the main deck for morning brushdowns of the elephants. You will get introduced to the elephants with a chance to interact and form bonds with them, walk with them, feed them and learn more about their behaviour, anatomy, social structure and more. Breakfast is usually served after the brushdowns and walk. 10h00 Programme ends. Rooms to be vacated by 10h30 please. You will be introduced to the elephants and interact and form bonds with them, walk with them, feed them and learn more about their behaviour, anatomy, social structure and more. Twin-bedded, en-suite bathroom (two three quarter beds). Bedroom open-plan to bathroom which comprises shower, basin, toilet. Two twin-bedded bedrooms (two three quarter beds per room). Shared bathroom between the two rooms with interleading doors. Bathroom comprises a ball-and-claw bath, shower, basin and toilet. The suite has four beds and one bathroom. This room is suitable for Dad, Mom and children. A very spacious suite comprising two queen beds next to one another. En-suite bathroom, comprising toilet, double basins, shower with bath combination. Mini bar and tea/coffee station. 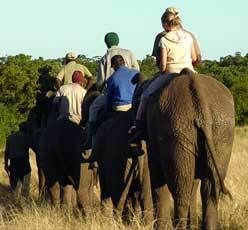 ELEPHANT RIDES ARE AN AVAILABLE EXTRA ON ALL ACCOMMODATION OPTIONS! Accommodation adjoins the elephant stables. A covered patio and lounge for relaxing/reading. A secluded swimming pool in the forest a few steps from the lodge. Main deck overlooking the elephant boma/adjoining curio shop and bar. Treehouse deck to observe elephants swimming. Fully licensed bar. Curio shop with interesting mostly elephant related items. Four course dinner around an open fire in the boma; breakfast served on main deck overlooking elephants. Tea, coffee and welcome drink included. Please contact us for any more information, times of programmes and rates. We look forward to seeing you.